Michelle graduated with a Bachelor of Business from the Queensland University of Technology in 1996. Michelle’s degree comprised a double major in Accountancy and a secondary major in Business Law and Taxation. She was awarded the Dean’s Award for Excellence. Prior to studying, Michelle worked for the Federal Government for four years as a Senior Policy Officer for the Department of Housing and Construction. Her work involved briefing senior management, including the Minister, and the evaluation of housing programs of assistance. Michelle also spent eighteen months working for the St Vincent de Paul Society, providing support to young people, drug and alcohol affected people and those suffering from mental illness. Whilst studying for her degree, Michelle worked for a press monitoring firm. Here she progressed from reading and analysing newspaper articles, to the position of General Manager. On completion of her degree, Michelle worked for the next 14 years in the State Actuary’s Office, within Queensland Treasury. Her work involved undertaking actuarial investigations of the Queensland Government’s superannuation funds. This ranged from providing superannuation consulting services, including fund and benefit design, to providing accounting and taxation certificates to ensure compliance with Commonwealth legislation. Michelle also co-ordinated the management activities of the office. This included operational and strategic planning and utilisation of human and financial resources. We were delighted to welcome Michelle to Active Rehabilitation Physiotherapy in 2012, to take on the role of Chief Financial Officer. She rapidly became an integral member of our Management Team. 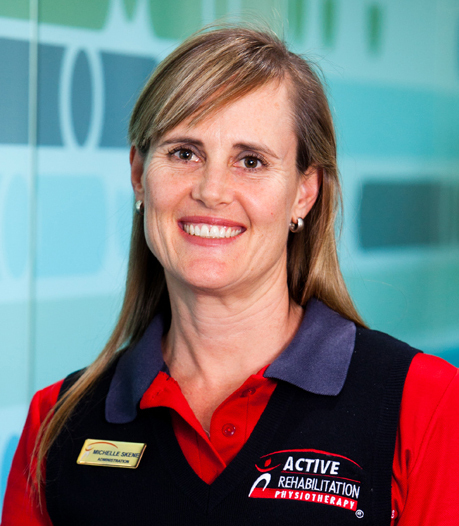 Michelle is a strong advocate of Active Rehab, who leads an active lifestyle, having a particular passion for cycling.